The knee is one of the most complicated joints in the body. Very simplistically, it can be considered a large hinge joint. However, the reality is that as the knee joint bends there is also rotation of the joint (the tibia rotates inwards) plus there is roll back of the femur on the tibia (on the lateral (outer) side). Knee flexion is therefore a highly complicated composite movement, that relies on multiple factors, including the shape of the bones, the ligaments in and around the joint and the pull of the muscles/tendons. When it’s working well, the knee joint is a marvel, and it endures literally millions of movement cycles a year. However, there is a lot inside the knee that can potentially go wrong. Some structures around the knee can heal well. However, there are many structures inside the joint that cannot heal up properly on their own after specific damage from trauma, which is why so many people end up with knee problems. The knee joint is also probably the 2nd most common large joint to suffer from arthritis and to need joint replacement surgery (2nd only to the hip joint). The surfaces of the bones in the knee joint are covered in a layer of smooth, white, shiny tissue that is a few millimeters thick, called the articular cartilage. This is the white glistening layer of tissue that you see on the ends of the bones if you crack open the joint of a chicken leg. The function of the articular cartilage is to make the joint surfaces smooth and low friction. Articular cartilage is highly specialized tissue, and its surface has the lowest friction of any substance known to man! The articular cartilage does not, however, have any blood supply. Instead, the cells get their oxygen and nutrients from diffusion from the synovial fluid in the knee, which also lubricates the joint. Unfortunately, once damaged, articular cartilage does not regenerate or grow back, and any damage to the articular cartilage tends to get worse with time, due to persistent wear and tear, rather than get better. Articular cartilage itself does not actually have any nerve fibres, but damage to the articular cartilage does cause increased pressure and stress on the underlying bone, which does have nerve fibres, and this is what probably causes the joint pain that can occur with articular cartilage damage. The other kind of cartilage in the knee joint is ‘meniscal cartilage’. There are two meniscal cartilages in each knee, and these are C-shaped wedges of elastic cartilages, like small potato wedges, that sit in between the femur and the tibia acting as load sharers and shock absorbers, like little rubber washers. 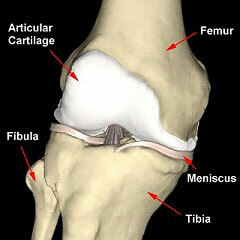 The medial meniscus sits in the inner side of the knee. 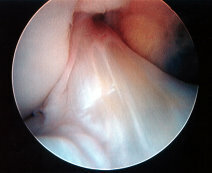 The lateral meniscus sits in the outer side. Together, the meniscal cartilages are referred to as ‘the menisci’. the tibia with the menisci missing. Same view with the menisci in place. The outer edge (peripheral 1/3) of the meniscus does have a reasonably decent blood supply (the red zone). However, the inner 2/3 does not. This inner 2/3 is referred to as the white zone, and the cells in this region of the meniscus are relatively sparse, relatively metabolically inactive, and (like articular cartilage) get their oxygen and nutrients by diffusion from the synovial fluid in the knee. The menisci are attached firmly to the bone of the tibia at the front and the back via anterior and posterior insertional ligaments. The back part of the meniscus is called the ‘posterior horn’, the side portion is ‘the body’ and the front section is ‘the anterior horn’. 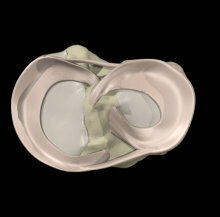 The menisci are attached to the capsule (lining) of the knee joint around their peripheral (outer) edges. The inner free margin is the thin end of the wedge. 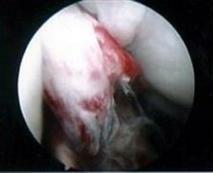 Meniscal tears are the most common injury presenting to a knee surgeon. Meniscal tears can cause pain, clicking, catching, giving way, locking and swelling in the knee. Unfortunately the large majority of meniscal tears don’t heal up (due to their poor blood supply, due to the fact that they are constantly compressed and stressed inside the knee, and due to the fact that the knee joint is full of fluid (not blood). 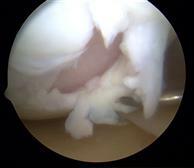 Therefore, meniscal tears often end up needing surgery, with a knee arthroscopy. 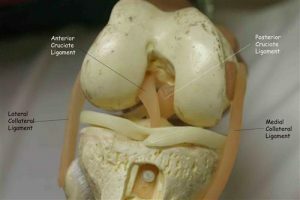 Model of a right knee, viewed from the front. The ACL sits in the middle of the knee joint. It arises near the front of the top of the tibia and passes upwards (superiorly), backwards (posteriorly) and outwards (laterally) to attach to the back of the medial side of the lateral femoral condyle of the femur. The ACL stops the shin bone (tibia) from wobbling too far forwards. It also has an important role in preventing excessive external rotation of the tibia, and hence the ligament is particularly important for pivoting type manoeuvres. The ACL is a strong ligament, with an ultimate tensile strength in the region of about 2000 Newtons (meaning that you could hang your body weight off it without the ligament snapping). However, the forces within the knee when there is impact on a bent knee often far exceed body weight. ACL tears tend to occur with twisting type injuries on a loaded bent knee, such as football tackles or ski injuries (if the bindings fail to come off). 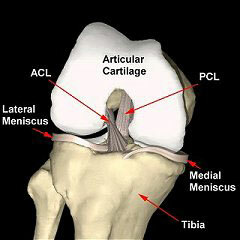 If the ACL tears then many people hear/feel a pop in the knee and there is severe pain plus large swelling of the joint. When the ACL tears, it is like a tight elastic bungee rope snapping inside the joint. The ends are normally very frayed, the ligament bleeds into the knee, and the torn stumps retract and scar up very quickly. Also, the knee joint is full of synovial fluid, not blood, which tends to wash away any blood clots, further preventing healing of the torn ligament. These factors mean that a torn ACL will not heal and repair itself. Partial tears can occur, but the term ‘partial’ can mean anything from 1% to 99%, and the degree of instability that might be associated with partial tears varies enormously. Once the acute injury has begun to settle down a bit and once people start trying to get going again, then the knee may feel unstable, with episodes of giving way. If the ACL is torn and if the knee is functionally unstable, then every time the knee gives way you are potentially causing further damage inside the joint. Therefore, anyone with a ruptured ACL and an unstable knee should seriously consider having surgery, to have the ligament reconstructed. The posterior cruciate ligament sits at the back of the knee, crossing the ACL in the opposite direction, and it prevents the tibia from slipping backwards. The PCL is actually a larger thicker ligament than the ACL. PCL injuries are far less common than ACL tears. The PCL may be damaged with dashboard-type injuries, during car crashes, where the tibia is pushed backwards. The other main mechanism of injury for PCL tears is where there is either hyperflexion or hyperextension of the joint. PCL tears present quite differently from ACL tears. Often the pain is not so severe and the knee does not swell up so much. The injury is often felt to be less major, with a quicker return to function, and in the longer term far fewer patients with PCL deficiency actually end up suffering from significant functional instability of the knee. However, patients’ knees often just ‘don’t feel right’, plus there can also be concomitant tears of the meniscal cartilages (that occur either at the time of the original injury or subsequently, due to increased strain on the menisci secondary to the increased laxity in the joint). PCL tears are quite often not just isolated, but instead quite frequently occur in association with other ligament injuries, particularly to the posterolateral corner. A knee with a torn PCL as well as a torn ACL (+/- other of the ligaments) is a severe and serious injury, and often represents an actual dislocation of the knee (which can be a fairly devastating injury). The PCL is ‘extra-synovial’, which means that it is not actually surrounded by synovial fluid in the knee, and hence it has a better blood supply. It is a larger, thicker ligament than the ACL, and also in many people the PCL can be splinted by one or two small ligaments that pass from the posterior horn of the lateral meniscus up to the femur (to the lateral edge of the medial femoral condyle), called the meniscofemoral ligaments. The PCL therefore has significantly better healing potential than the ACL, and fortunately most isolated PCL tears actually do well without needing surgery, with just time and physiotherapy treatments. Most combined/multi-ligament injuries do actually need surgery, with reconstruction of all of the torn ligaments. The collateral ligaments sit on the inner (medial) and outer (lateral) sides of the knee and prevent the knee from wobbling from side to side. The medial collateral ligament (MCL) is a reasonably broad ligament that passes from the inner side of the femur to the inner side of the tibia. It is extra-synovial (not bathed in joint fluid) and has a very good blood supply. 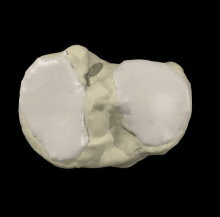 There are two separate portions to the ligament: a superficial portion that is nearer the surface and that is longer, and a shorted deep portion. The MCL prevents outward angulation (valgus) of the shin (tibia). The MCL is quite frequently injured, particularly from valgus strain injuries, where the knee is hit from the outer side and forced inwards. Most MCL injuries tend to be partial. However, partial can mean anything from 1% to 100%. When the ACL is torn, it is very common for the MCL to be torn or partially torn too, at the same time. Nearly all MCL injuries heal up very well on their own, without needing surgery. If the tear is relatively minor then it is likely to heal up quickly. If it is a larger tear, then the patient might need to protect the knee with a hinged knee brace, to offload the pressure/strain on the MCL and to allow it to heal without stretching. A small percentage of patients with MCL injuries may end up with persistent pain, and this can be from chronic inflammation of the deep fibres. This tends to show up clearly on an ultrasound scan and can normally be cured with a simple ultrasound-guided steroid/cortisone injection. Thankfully, it is only in a very small percentage of cases that surgical repair or reconstruction of the MCL is actually necessary. The lateral collateral ligament (LCL) is a smaller, thinner, more rope-like ligament than the MCL. It is found on the outer (lateral) side of the knee, originating from the lateral epicondyle of the femur, passing down and attaching to the top of the head of the fibula. The LCL prevents the tibia from bending too far inwards (into valgus), i.e. into a ‘knock kneed’ position. The LCL is injured far less frequently than the MCL, and isolated LCL injuries are actually fairly rare; LCL damage is far more likely to be seen in association with other concomitant injuries, particularly to the posterolateral corner ligament complex. The popliteus tendon – this arises from a muscle at the back of the knee, and the tendon wraps around the outer side of the knee, passing up and diagonally to attach to the lateral side of the femur, close to the attachment of the LCL. 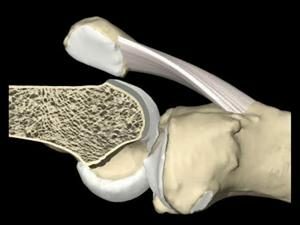 The popliteofibular ligament – this is a small ligament that passes from the head of the fibula to the popliteus tendon. The exact shape and configuration of the posterolateral corner complex can vary significantly between different individuals. However, regardless of the exact anatomical details, its function is to prevent excessive external rotation of the tibia. Isolated posterolateral corner injuries are fairly uncommon, and posterolateral corner injuries are most commonly seen in association with other more major ligament injuries in the knee, particularly the ACL and/or the PCL. The patella (kneecap) is the bone at the very front of the knee. It sits in between the quadriceps tendon and the patellar tendon, and acts like a pulley at the front of the joint, helping to increase the angle of pull of the quads to aid knee extension. Patellofemoral Joint viewed from the side. Patellofemoral joint viewed from the top. 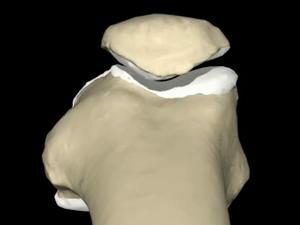 The back of the kneecap is V-shaped and is covered in a layer of articular cartilage. The kneecap sits in a V-shaped groove at the front of the knee, called the trochlear groove. Together, the articulation between the back of the patella and the trochlear groove at the front of the femur is referred to as ‘the patellofemoral joint’.